Traditionally said to have been one of the churches built, this time in 639, by San Magno (Saint Magnus), to whom the Saviour (Salvatore) had appeared in a dream and sent him a sign - a red cloud this time. The first documented date is 1067. This church is said to have had an iron-grating floor with running water beneath. A rebuilding after the fire of 1106 can be seen on De Barbari's famous map of 1500. It is in the porch of this Romanesque church that Pope Alexander III is said to have taken refuge disguised as a pilgrim and fleeing Emperor Frederic Barberossa. (But another story has him working for six months in the kitchen of the convent of Santa Maria della Carità.) From 1267 San Salvador housed the relics of the first patron of the city, Theodore, which had previously been in San Marco. The present Renaissance church was begun in 1506 to designs by Giorgio Spavento, with Tullio Lombardo supervising, helped by his father Pietro, following Spavento's death three years after work began. The church was largely completed around 1523, with Jacopo Sansovino responsible for the completion of work from 1530-34 and for the lovely frescoed side entrance onto the Mercerie. 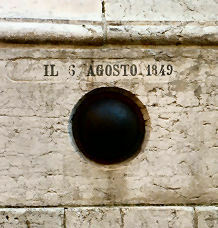 The façade was rebuilt 1649-63 to a design by Giuseppe Sardi with sculptural decoration by Bernardo Falcone. It has an Austrian cannonball somewhat neatly embedded in the bottom left hand corner. The church is monumental with a lovely dark grey interior, reminding me of some favourite churches in Florence, although the multiple-domed interior is supposed to hark back to the Byzantine and to San Marco. Despite the darkish stone it's a well-lit church. The interior is designed on mathematical principals, based on the proportion of 2:1 - square bays alternating with half-bays. 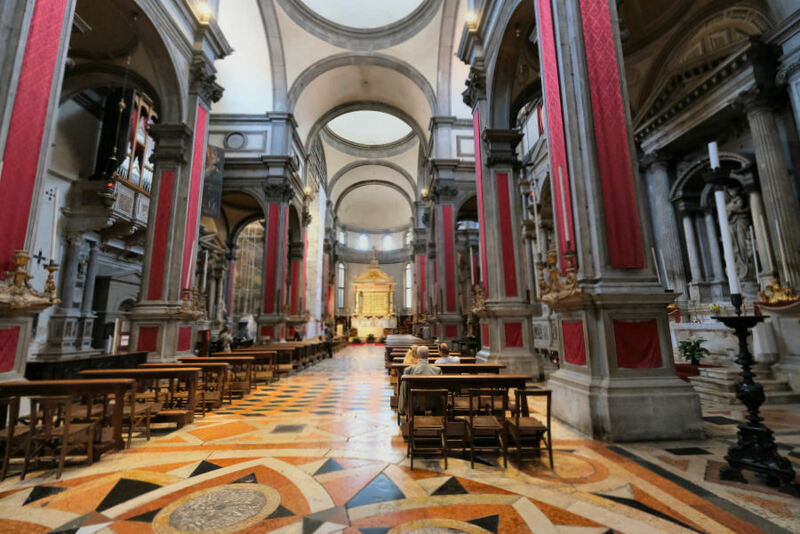 The remains of Saint Theodore, Venice's original patron saint, are in the chapel to the right of the apse. 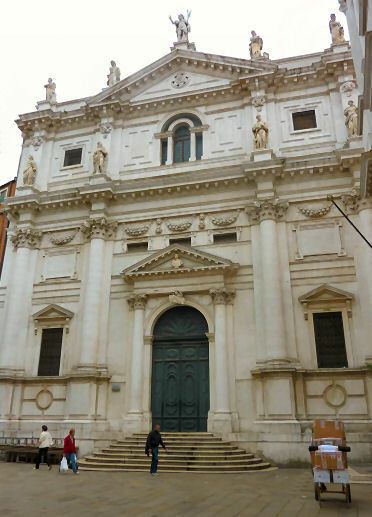 The body of the church is mostly tombs and painting-free altars, including an altar of the Scuola dei Luganegheri (Guild of Sausage Makers) with statues by Vittoria of Saint Sebastian (with a metal arrow embedded in the stone) and Saint Roch (with a very discreet sore on his leg). There are a pair of paintings just before the shallow transept, with the tomb of Caterina Cornaro at the end of the right one. The great Titian Annunciation of 1563/6 (see far below right) sits on an altar by Sansovino, next to his tomb of Doge Francesco Venier. It's one of the few late Titians (he painted it at the age of 90) remaining in Venice in the place for which it was commissioned, by Antonio Cornovi della Vecchia from Bergamo in May 1559. And in case you're wondering why Mary is lifting up her scarf and showing the angel her ear, it's because that was evidently the organ through which the holy spirit (specifically The Word) entered and impregnated her. The other great Titian is another late one - the damaged but explosive and impressive Transfiguration of 1560 over the high altar, which hides a 14th century silver-gilt reredos revealed only at Christmas, Easter and at the feast of San Salvador on the 6th of August. 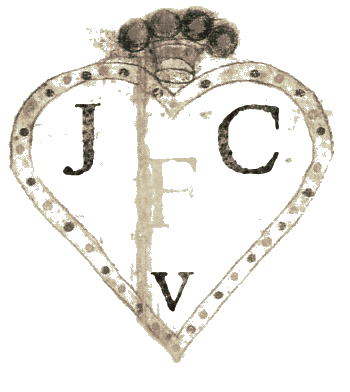 A pulley lowered the painting on feast days and the canvas had suffered from this rough use and had been nastily over-painted to hide damage. 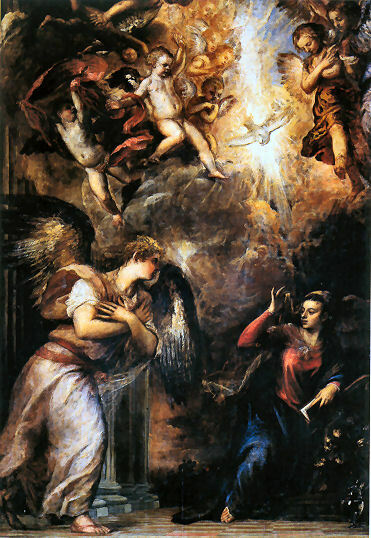 Restoration in 1997 revealed the true Titian, conceived as an image to work in its unique situation. A third Titian, a Crucifixion, was commissioned by Flemish merchant Giovanni D'Anna for his family altar right opposite the Cornovi chapel. 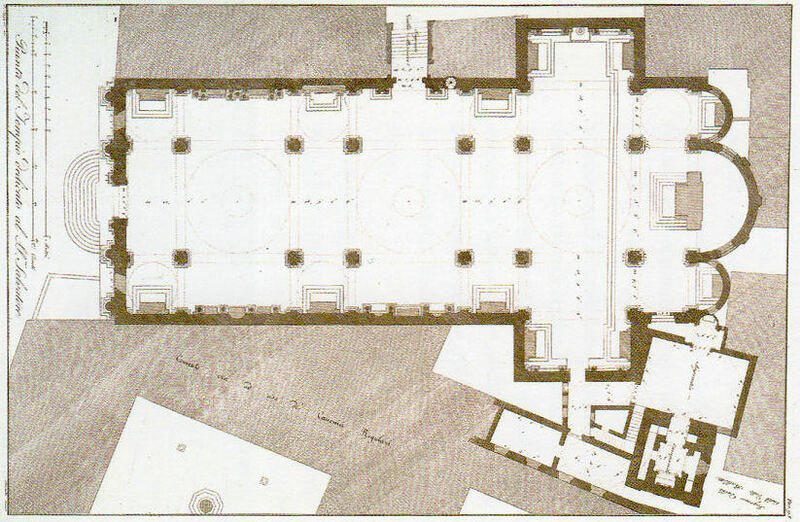 The D'Anna family suffered financially following Giovanni's death, however, and work on the chapel halted. The Crucifixion is lost, or may indeed never have been painted. The commissioners of these three paintings and Titian himself were all members of the Scuola Grande di San Rocco and there is a possibility that it was a co-ordinated commission. 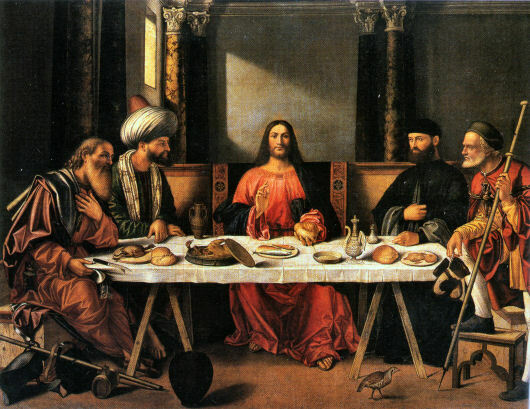 Then there's The Supper at Emmaus (see below) a stiff piece of work which tradition ascribed to Giovanni Bellini, or a pupil of Bellini called Benedetto Diana (according to Layard) or Carpaccio (according to Crowe and Cavalcaselle) or to Bellini's studio - it depends on which book you read, or which art historian you choose to trust. The church itself used to cover its options by having Bellini and Carpaccio scribbled in biro on masking tape stuck on the plastic sign nearby, with question marks. They then settled on 'Anonymous copy of a Bellini', but recent (2011) restoration saw previous overpainting removed, with a date of 1513 arrived at and it's now believed that it is the work of Vittore Carpaccio, painted for Girolamo Priuli. There are also works by Paris Bordone, Palma Giovane (The Virgin of the Carmelites appearing to Saints Anthony Abbot, John the Baptist, and Francis of Assisi, on the altar of the Luganegheri) and, on the inside of the organ doors, two paintings by Franceso Vecellio, Titian's brother, who is also said to be responsible for the frescoes in the side entrance. The sacristy supposedly has more frescoes by him, discovered in the 1920s and restored in 2003. Two very early Bellinis, a Crucifixion and a Transfiguration, both still looking very indebted to Mantegna (and both in the Correr Museum) may have been painted for San Salvador. The latter may have come from here or San Giobbe, as both churches are recorded as having had a Bellini depicting this scene. A Giambattista Tiepolo altarpiece depicting four saints, painted for the Cornaro family for the right transept's right-hand altar, was destroyed in a fire. De Barbari's map shows a chunky detached tower that was a 14th-century renovation of the original. Restoration in 1881 saw the tower raised. 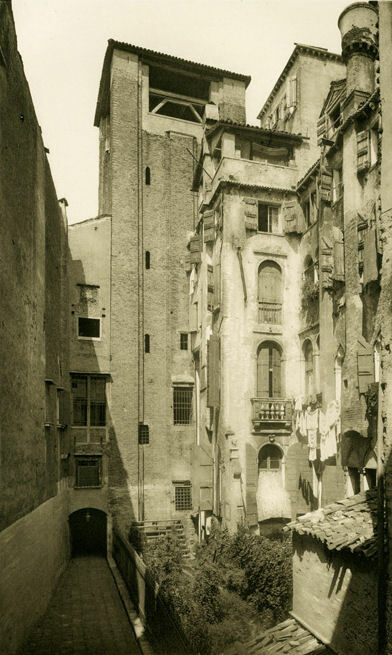 The shaky structure had its foundations broadened in 1903 and 1911. The attached monastery, with its restored cloisters (entrance to the right of the church facade) is said to be Sansovino's work too. Suppressed by Napoleon in 1810, it is now the HQ of a phone company and open Tues-Sun 10am-6pm. Friday 25th was the day of the Annunciation to our Lady. On this day in 421 the city of Rialto was founded and the first stone laid, on which day - according to Saint Augustine - the world was created and the Lord Jesus Christ was crucified. On this day in 1507 the first stone for the new building of San Salvador was laid. Thus this is a very great feast day. In the interior of the church are some of the best examples of Renaissance sculptural monuments in Venice. It is said to possess an important pala of silver, of the thirteenth century, one of the objects in Venice which I much regret having forgotten to examine; besides two Titians, a Bonifazio, and a John Bellini. The latter ("The Supper at Emmaus") must, I think, have been entirely repainted: it is not only unworthy of the master, but unlike him; as far, at least, as I could see from below, for it is hung high. The afternoon hours are shorter (4-6 pm) in the summer (June-August). The church has a website but it currently (July 2018) block access if you are using an adblocker, a very strange thing for a non-commercial site to do. It looks like greed. Scaffolding update July 2018 There is a high fence all along the façade and a big scaffolding and tin-sheet canopy over over the entrance. This type of construction is usually just to keep tourists away from crumbling stonework, and so it'll presumably remain until some actual work gets going. The campanile by Ferdinand Ongania in the 19th century.